CHI Papers are archival publications of original research in the field of Human Computer Interaction (HCI). Submission deadline: As in recent years, there are now two deadlines for submission: one for the title, abstract and metadata, and another for the full paper and other material. The deadline to create your submission and set the title, abstract, and authors, as well pick your subcommittee and other details of your paper is September 14. A week later (September 21), the rest of the materials (the actual paper, supplementary materials, video) are due. Please see details below. Submission format: Please use the appropriate template, available for both LaTeX and Word (Windows and Mac). Subcommittees: Every year, the make up of subcommittees changes as the field shifts and volumes of submissions change: some earlier committees have either had a reduction in scope, while others have expanded. Please carefully review the CFP and linked documents to ensure you select two appropriate subcommittees for your submission. Initial submission deadline (title, abstract, authors, subcommittee choices, and other metadata. ): September 14, 2018 at 12pm (noon) PDT / 3pm EDT / 8pm BST. Submission materials upload deadline: September 21, 2018 at 12pm (noon) PDT / 3pm EDT / 8pm BST. Reviews sent to authors: November 15, 2018 at 12pm (noon) PST / 3pm EST / 8pm GMT. Rebuttal period closes: November 21, 2018 at 12pm (noon) PST / 3pm EST / 8pm GMT. Decision notification: December 10, 2018 at 12pm (noon) PST / 3pm EST / 8pm GMT. Reviews released: December 14, 2018 at 12pm (noon) PST / 3pm EST / 8pm GMT. Camera-ready papers due: January 7 (updated), 2019 at 12pm (noon) PST / 3pm EST / 8pm GMT. Video previews deadline (optional): January 22, 2019 at 12pm (noon) PST / 3pm EST / 8pm GMT. Submission: Made to Precision Conference. Please note that CHI 2019 is using a new version of Precision Conference (PCS 2.0). You will have to create a new login/password for this system. Submission format: anonymised, 4 to 10 page (plus references) Paper with a maximum 150 word abstract. Please use the appropriate template. Archives: Papers are archived in the conference proceedings, available on the ACM Digital Library. CHI Papers are refereed publications of original research in the field of Human Computer Interaction (HCI). They represent mature, complete research. CHI Papers are read and cited worldwide, and have broad impact on the development of HCI theory, method, and practice. Authors must present accepted Papers at the CHI Conference. 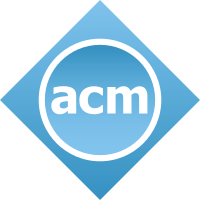 Accepted manuscripts appear in the Proceedings of the ACM Conference on Human Factors in Computing Systems, which appears in the ACM Digital Library. The ACM Digital Library includes a mechanism to enable authors to provide perpetual free public access to their papers. Accepted Papers may come from any arena of HCI activity: academia or industry; science, engineering, or craft; analysis or design. Acceptance is highly competitive: all accepted Papers will score highly on originality, significance, validity, and presentation quality. We are looking forward to seeing your best work! 1. Write and format your Paper. Your submission must be original; it cannot be published or under concurrent review elsewhere. If you make multiple submissions to CHI 2019 Papers, they should be distinct from each other. Papers should be between 4 and 10 pages long (plus references). References do not count toward this length. Page length includes figures, appendices, and an abstract of less than 150 words. Submissions that exceed these limits will be desk rejected. A word about paper length. It should be noted that, in the past, authors were often encouraged to submit a maximum-length paper. For CHI 2019, authors are encouraged to submit a paper of length proportional to its contribution. If your research contribution requires only 4, 7, or 9 pages (plus references), please submit a paper of that length. Reviewers will be instructed to weigh the contribution of a submission relative to its length. Papers should be succinct, but thorough in presenting the work. Typical Papers will be 8-10 pages long (plus references) but papers can be shorter (e.g. 4-5 pages) if the contribution is smaller. Shorter, more focused Papers are encouraged, and will be reviewed like any other paper. Papers whose lengths are incommensurate with their contributions will be rejected. Papers shorter than 4 pages or longer than 10 pages (excluding references) will also not be considered. 2. Prepare supplementary material (optional). Your submission may be accompanied by a short video or by other supplementary material. Video figures do not have a specified limit for duration, although we recommend staying within 5 minutes. Other supplementary material may include, for example, survey text, experimental protocols, source code, and data, all of which can help with replicability of your work. Any non-video supplementary material should be submitted as a single .zip file, including a README file with a description of the materials. Your total submission size (paper + supplementary material) must be no more than 120 MB. Because not everyone who reads the Paper will view the supplementary material, your submission must stand on its own, and will be reviewed as such. All such supplementary material should be anonymised as well. In instances where your new submission builds directly on a project described in another, as-yet unpublished paper, it is recommended that you submit an anonymised version of that other paper as supplementary material. You may choose to also include a note of explanation as to the novel contribution of the present submission. If the previous work is already published, it may simply be cited in the body of the paper as per usual, and should not be included in the supplementary materials. 3. Select a subcommittee. CHI receives over 2,500 Papers submissions. In order to provide high-quality reviews by experts for all submissions, the CHI program committee is divided into topical subcommittees. When you submit a paper, you will state a preference of two subcommittees whose mandates you believe your topic fits into. It is your responsibility to select the subcommittees that offer the best expertise to assess your research, and that you believe will most fully appreciate your contribution. If you are unsure, you can email the subcommittee chairs for advice. The program committee may re-assign submissions to a different subcommittee if neither of the subcommittees selected by the authors possesses adequate expertise in the submission’s topic. September 14 (12pm (noon) PDT / 3pm EDT / 8pm BST) Submission Deadline: Authors must submit their title, abstract (150 word max), list of authors, subcommittee selections, and other metadata before this deadline. After this deadline, Precision Conference will only allow the contact author to edit his/her submission files, and will not allow modification to the submission’s metadata. No new submissions will be allowed after this deadline. Note that, unlike some other ACM conferences with two-deadline processes, you will be free to edit the content of your paper and other uploaded files up to the materials upload deadline. However, you will not be able to modify the metadata after this deadline (title, abstract, authors, subcommittee selections, etc.) These changes can be made once papers have been accepted for publication. September 21 (12pm (noon) PDT / 3pm EDT / 8pm BST) Materials Upload Deadline: All materials – the submission itself, the video figure, and other uploads – must be submitted before this deadline. No extensions will be granted. Only papers whose submissions were made by the submission deadline may be uploaded. The submission system will open for submissions approximately four weeks before the submission deadline. Details on the Review Process itself are described in the Papers Review Process. We strongly encourage authors of Papers submissions to also participate in Interactivity (previously Demonstrations). This is most applicable to Papers that describe interactive technologies or experiences and allows authors to present a hands-on demonstration of their research in a high-visibility, high-impact forum. Authors of Papers who wish to participate in Interactivity are required to prepare a separate, non-anonymised submission for the Interactivity track. There will be no formal association between submissions to Interactivity and their associated Paper. The content of the submission can be adapted from the existing Paper. Authors will be notified of conditional acceptance or rejection on December 10, 2018. At this point, contact authors of conditionally accepted Papers will receive instructions on how to prepare and submit a final version by January 7, 2019. For conditionally accepted Papers where a shepherd has been provided, contact authors will receive additional information on how to work with their shepherd to make appropriate changes. These shepherded changes must be made by December 28, 2018, in order to allow appropriate time for shepherds and authors to agree on the final changes before the January 7, 2019 camera-ready deadline. A member of the Program Committee will check that the final version meets the requirements for publication and, if so, will finalise the acceptance. Authors are encouraged to submit their revision earlier than the deadline, in case it is judged that the paper does not meet the committee requirements. If the authors are unable to meet these requirements by the deadline, the Papers Chairs will be notified and may be required to remove the paper from the program. The camera-ready version has to follow the new LaTeX and Word templates from ACM. Should you need technical assistance, please direct your technical query to: acmtexsupport@aptaracorp.com and they will respond within 24 hours. Authors will be asked to submit a 30-second video preview summarizing the paper; this is optional, but highly encouraged, as it will increase the visibility of your paper before, at the conference, and in the ACM digital library in perpetuity. Authors will also be required to assign either copyright or license to the ACM or to pay a fee to ACM for Open Access (details about ACM rights management: http://authors.acm.org, and about the ACM author-izer service: http://www.acm.org/publications/acm-author-izer-service). Obtaining permissions to use video, audio, or pictures of identifiable people or proprietary content rests with the author, not the ACM or the CHI conference. Authors are required to present their work in a scheduled session with other CHI Papers. Paper authors have been traditionally allowed up to 20 minutes total (about a 15 minute talk with 5 minutes of questions) to present their work; however, this will depend on the number of accepted papers, which will be known in December 2018. There will be no distinction made between papers based on length in the proceedings, or ACM Digital Library. Papers whose authors are not at the conference to present their paper may be removed from the ACM Digital Library. Accepted Papers will be distributed in the CHI Conference Proceedings available in the ACM Digital Library, where they will remain accessible to thousands of researchers and practitioners worldwide. Video figures of accepted Papers will be archived on the ACM Digital Library.